Interstate 580 was designated along the North Freeway from I-480 north to Lake Street but dropped before the freeway was completed. 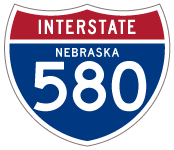 Interstate 580 in Nebraska was designated along the North Freeway, which carries U.S. 75 north from Interstate 480 outside Downtown Omaha to the Miller Park-Minne Lusa community. 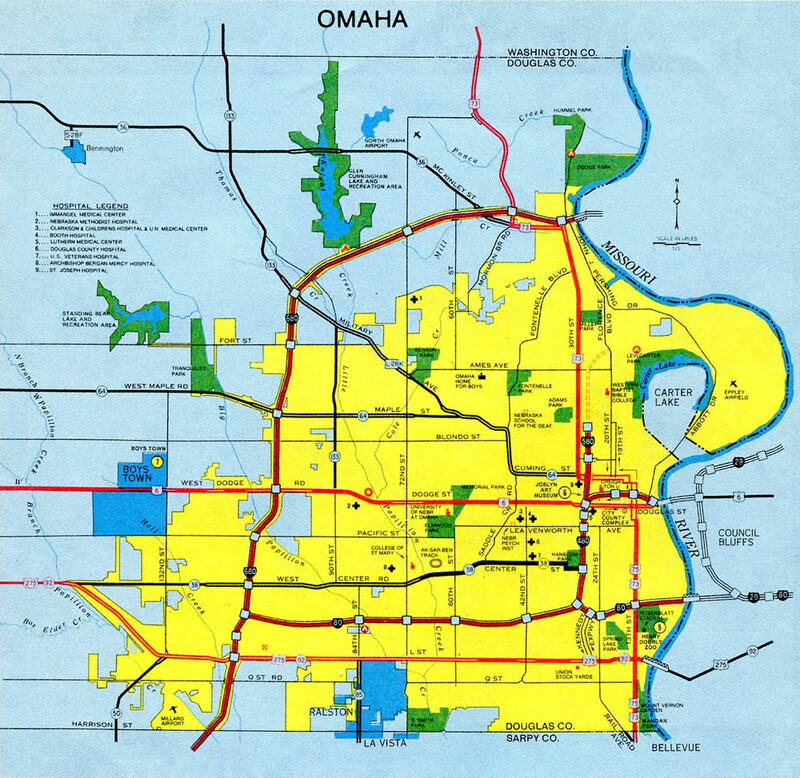 The North Freeway links I-480 with Eppley Airfield (OMA) and the North Omaha area. The North Freeway (later I-580 and U.S. 75) proposed from I-480 to Ames Avenue in 1968. The canceled West Freeway appears as well from Interstate 480 west to Saddle Creek Road. Ramps constructed at the I-480/North Freeway interchange for the incomplete West Freeway were dismantled during a often delayed project from 2005 to 2010. The Lake Street off-ramp was northernmost extent of Interstate 580, as the route was decommissioned before construction began in earnest along the North Freeway to 30th Street in 1984. Photo taken 06/18/15. U.S. 75 (North Freeway) splits with the Storz Expressway east to Eppley Field (OMA) beyond the Ames Avenue overpass. Photo taken 06/18/15. The Arthur C. Storz Expressway arcs east around the Levi Carter community to Abbott Drive and the passenger terminal of Eppley Airfield (OMA). 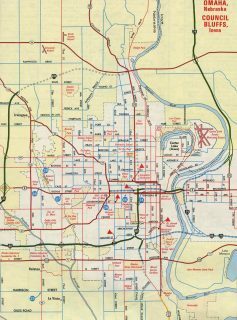 Originally a three-wye interchange was planned to join the North Freeway and Storz Expressway. Photo taken 06/18/15. U.S. 75 (North Freeway) veers west and intersects Sorenson Parkway at-grade before transitioning onto 30th Street north to the Minne-Lusa and Florence communities. Sorenson Parkway meanders west to Northwest Omaha and Nebraska 133 (Blair High Road). Photo taken 06/18/15. U.S. 75 south separates from 30th Street onto the North Freeway beginning. 30th Street continues south parallel to the freeway as the historic alignment of U.S. 73. Photo taken 06/18/15. A set of traffic lights attached to a sign bridge governs movements between U.S. 75 (North Freeway) south at the ending Sorenson Expressway and beginning Storz Expressway. Photo taken 06/18/15. Storz Expressway travels west as a limited access route from 16th Street to the wye interchange with U.S. 75 (North Freeway). Photo taken 09/04/05. A left-hand ramp joins the ending Storz Expressway with U.S. 75 (North Freeway) south to Interstate 480 and Downtown Omaha. Photo taken 09/04/05. U.S. 75 travels as a freeway south from here to Bellevue. Sorensen Parkway west takes over for the ending Storz Expressway to connect the airport with U.S. 75 (30th Street) north to Florence and continue to Northwest Omaha. Photo taken 09/04/05. U.S. 75 (North Freeway) passes through the diamond interchange with Lake Street, one mile north of the merge with Interstate 480. The signed extent of Interstate 580 began at Lake Street. Photo taken 09/05/05. Traffic splits between the continuation of U.S. 75 south onto Interstate 480 south and a left-hand ramp for Interstate 480 east from just south of the Hamilton Street overpass. Photo taken 09/05/05. Approaching the Cuming Street underpass, motorists separated into ramps for I-480 as construction on the five-year project to rebuild the directional interchange with the inner loop and the unconstructed West Freeway was underway. Photo taken 09/05/05. The on-ramp from Cuming Street connects with both directions of Interstate 480 as a flyover turned eastward ahead of 24th Street. The left-hand ramp to Council Bluffs was rebuilt during 2005-10 construction. Photo taken 09/05/05. Passing by Creighton University, Interstate 480 turns southwest at the former south end of I-580. Exit 2C departs next for the North Freeway to Eppley Field (OMA). Photo taken by Dale Sanderson (2001). Interstate 480 west at the historic northbound beginning of Interstate 580 (North Freeway). Exit 2B followed for 30th Street and U.S. 6 (Dodge Street) via 31st and Davenport Streets. Photo taken 09/05/05. The 30th Street off-ramp (Exit 2B) was a remnant from the canceled West Freeway. The West Freeway would have paralleled U.S. 6 (Dodge Street) west to Interstate 680, where the Dodge Street Expressway now begins. The local connection to Gifford Park here was rebuilt to end at 30th Street at-grade. Photo taken 09/05/05. Since dismantled, all of the bridges pictured here were remnants from the unconstructed West Freeway. They included the eastbound ramps to I-480 east and the North Freeway and the off-ramp from I-480 north to 30th Street. Photo taken 09/05/05. Interstate 480 & U.S. 75 emerge from a below grade section of freeway to separate at the U.S. 6 (Douglas and Dodge Street) overpasses. The original interchange saw the mainline default onto the North Freeway while I-480 utilized a TOTSO (turn off to, to stay on) connection. Interstate 480 now travels through the middle of the interchange with four overall lanes. Photo taken 09/05/05. A left-hand exit previously connected Interstate 480 & U.S. 75 north with 31st Street at the Gifford Park neighborhood to the west. This ramp was built in 1971 for the West Freeway but permanently closed in 1984. Photo taken 09/05/05. The West Freeway off-ramp traveled above the southbound lanes of U.S. 75 and 30th Street before combining with a ramp from I-480 west and ending at 31st and Davenport Streets. Photo taken 09/05/05. Additional flyovers carried traffic from U.S. 75 south and 30th Street east to Interstate 480 east. The 30th Street ramp was demolished during 2005-10 reconstruction. Photo taken 09/05/05. “32 – Year Project Divided Community Is Freeway Progress? Some Still Unsure.” Omaha World-Herald, September 17, 1986. 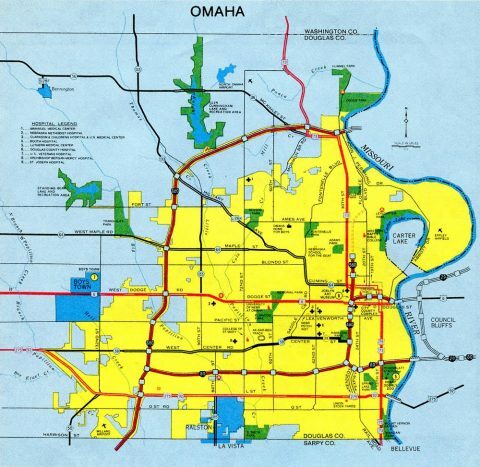 “Traffic Rolls to 30th and Fort Streets Freeway Is Seen as Boon for North Omaha.” Omaha World-Herald, November 16, 1988. 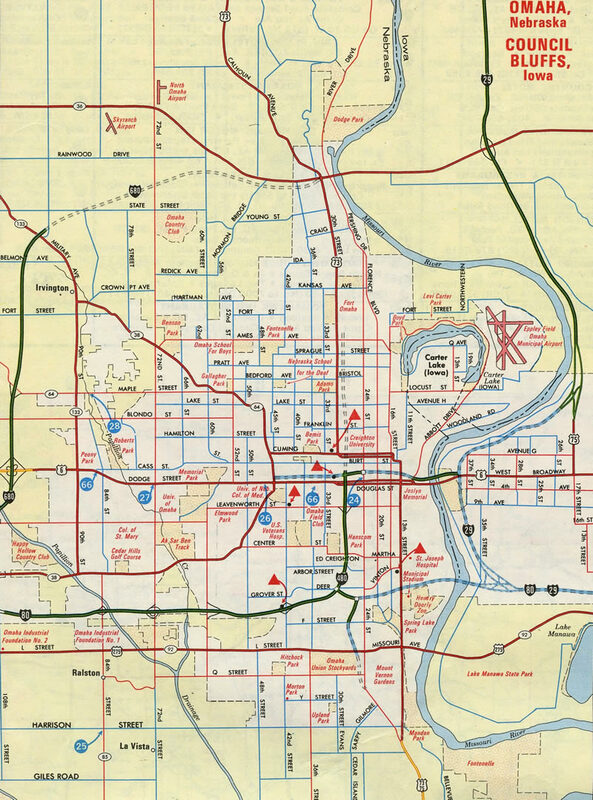 “Utilities to Spend $3 Million In ’84 on Path for Freeway.” Omaha World-Herald, December 10, 1983. “North Freeway Gets $6.2 Million Grant.” Omaha World-Herald, December 12, 1984. “North Freeway Is Now Open Past Lake St.” Omaha World-Herald, November 15, 1988. “Two Down, One to Go In Northern Freeways.” Omaha World-Herald, July 25, 1989. “End of U.S. 73 Signs To End the Confusion.” Omaha World-Herald, December 7, 1984. Page updated March 15, 2016.